The Slovak Catholic Sokol fraternal benefits are jewels in the fraternal benefit society community. Our programs promote health, religion and ethnic pride. The basis for our programs are the lodges, which are deeply rooted in supporting their local churches and communities. Take the time to find an activity or a program for you and your family or download our brochure today! Our programs emphasize our belief in both physical and mental health, as well as our commitment to the fraternal way of life. These programs not only offer the opportunity to compete against each other, it also develops the sense of teamwork and camaraderie. These friendships exist beyond team members; it carries over to building new and life-long relationships throughout the organization. Fraternal programs exist on the International, District, Regional (Group) and Local levels of the organization. 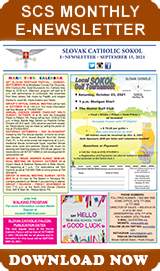 Throughout the Sokol community, which encompasses ten states and Canada, fraternal activities thrive. In addition to the athletic programs many of our local groups and local assemblies/wreaths host social events, fund raisers and events that give back to members and local communities. Another avenue of fraternalism is the number of social clubs that are affiliated with our local assemblies. These social clubs afford a local gathering place for our members to meet, socialize, and plan the fundraising and sporting events.